Home » The Reformation » How influential was Ulrich Zwingli? How influential was Ulrich Zwingli? Citation: C N Trueman "How influential was Ulrich Zwingli?" Ulrich Zwingli is one of the least well-known leaders in the Reformation movement as Martin Luther andJohn Calvin are both better known. Zwingli may have been influential in Zurich but did his influence ever extend out of the Swiss city? 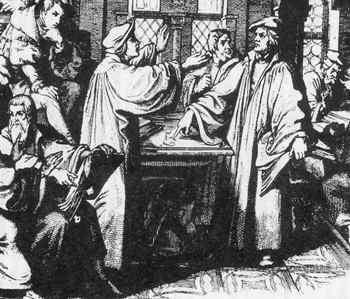 Northern Germany was very much under the influence of Martin Luther and the public spat between both men at the Marburg Colloquy did a great deal to undermine whatever influence Zwingli had in that area. Southern Germany tended to be under the control of the Catholic Church as Bavaria dominated the region. Therefore within what we now call Germany, Zwingli had little influence. As a city, Zurich was too small to have much influence elsewhere. The merging of the church and state could work there because of the size of the city. Whether this would have worked in a larger city is open to debate. Martin Bucer had the same doctrinal views at Zwingli but he believed that the church and state should be two separate authorities which should work in co-operation. Though Strasburg became a refugee for Protestant refugees, its lack of natural defences and military strength meant that it did not become a Protestant stronghold. Zwingli was associated too much with the educated urban classes and he did not have widespread social appeal. Zwingli was not a social reformer. He quickly lost the support of the peasants and the artisans, especially when the death penalty was introduced for Anabaptists – a group that offered radical social change and appealed to the less-well-to-do. The geography of Switzerland itself made it difficult for Zwingli’s beliefs to spread within the country. Mountain passes and the isolation of some cantons made the spread of new ideas at the very least difficult and at the worst all but impossible. Therefore Zwingli’s influence was very much localised to one small area (Zurich) as opposed to Luther whose beliefs spread much further. Zwingli’s belief that a state should be church-controlled could only work in a small region where there was no history of one major family dominating that region. Zurich fitted this description well – but Zwingli’s influence only remained localised.